Should I buy a RAVPower power bank? Does RAVPower offer the right power bank for you? While most aspects of phones improve with each new model, one aspect that often doesn’t improve is battery life, which means a power bank can be a very useful thing to have. The question then is which to buy, but with this article we’ll help guide you through that, with a particular focus on RAVPower. 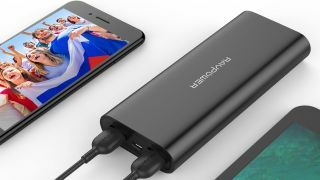 RAVPower is a fairly large name in power banks so you might well be considering one of its products already, especially if you’re reading this, and they’re generally a good option, but there are some things to consider when deciding whether to buy a RAVPower power bank and when deciding which to buy. So read on for a look at the typical design, features and prices of RAVPower’s power packs. The majority of RAVPower’s power banks come in a choice of black or white, though quite a few only come in black, as they’re seemingly designed to blend in rather than stand out. However, certain models come in some funkier color choices. The RAVPower 6,700mAh Portable Charger for example can be found in pink, while the RAVPower Ace 22,000mAh Power Bank can be bought in blue or red. Colors aside, RAVPower’s power banks have fairly plain designs, much like most rival power banks. Other than the company name and various ports, they tend to just have lights, indicating when they’re on and how much battery is left. The RAVPower 22,000mAh Power Bank for example, which makes our list of the best power banks available, has a slim design (by high-capacity power bank standards) with a footprint that’s only a little bigger than a large smartphone, and four little lights giving an indication of the battery level of the power bank itself. The more lights that are on, the more charge it has left. All of RAVPower’s power banks are designed to be as portable as possible, since it’s when on the move that you’re most likely to need them. That means they’re all suitable to be chucked in a bag and some are even pocket-friendly, though generally only the smaller capacity ones, such as the 6,700mAh and 10,000mAh ones. RAVPower’s power banks come with anything from 6,700mAh to 32,000mAh of battery, so whether you need something small and very portable that might only recharge your phone once, or you want something that can keep multiple gadgets powered up for days, there are suitable options. Many RAVPower power banks also have multiple USB ports so you can charge more than one device at a time, with Android, iOS and Windows devices all supported by many of them. Some RAVPower power banks, such as the RAVPower Xtreme 26,800mAh PD Power Bank, can even charge a Nintendo Switch while you’re playing it. That particular model can also be recharged via USB-C, though many of them use micro USB and charge slower, so that’s something to watch out for if charging speeds for the power bank itself are important to you. Similarly, some of these devices can charge your gadgets faster than others. The example above can output up to 30W of power, but some are less powerful. It’s also worth looking out for Qualcomm Quick Charge support, as power packs with this are typically the quickest to charge other compatible devices. Not many of RAVPower’s power banks offer this, but the RAVPower Turbo 20,100mAh Power Bank with QC 3.0 for example does. None of RAVPower’s power banks offer wireless charging, but some can be recharged using solar power, making them a handy choice if you’re camping or anywhere else where your power bank is likely to get a lot of sunlight. RAVPower’s power banks are generally in line with the pricing of other brand-name power banks. In fact if anything they’re sometimes cheaper, which is to say, they’re more expensive than the no-name options, but they’re still very competitively priced, while giving you the reassurance of buying from a trusted brand. The RAVPower Xtreme 20,000mAh for example costs $37.99 / £25.48 (around AU$45) at the time of writing, while the similar capacity Anker PowerCore II 20000 costs $59.99 / £41.99 (around AU$75). So RAVPower’s is significantly cheaper. On the other hand, Aukey has a 20,000mAh power bank that can be found for less still. So it’s certainly worth considering other options and taking a look at our Anker power bank guide, but RAVPower’s power banks are a safe choice if you find one at the right price, with the right features. Whatever brand you go for it’s also worth keeping an eye out on Black Friday and during other sales, as power banks often get discounted during these times.